CM Magazine: Nana's Cold Days. Adwoa Badoe. Illustrated by Bushra Junaid. Toronto, ON: Groundwood Books/House of Anansi Press, 2002. "Ken peeked through the window to see whether Nana would wake up. "Ssh," said Rama. "You might wake her up and make her mad." "She won't hear a thing buried under three top sheets, three blankets and three comforters," said Ken. Nana shifted under her sheets and turned to face the door, still fast asleep. "She will never wake up again," said Ken. And Nana did not wake up, not all that night and even the next day. Ken and Rama's grandmother is visiting from Africa. She has a hard time adjusting to the chilly winter climate: "'Br-r-r-r,' she said. 'It's too cold for living things.'" Taking to her bed, she refuses to emerge from beneath a pile of blankets and comforters. The family tries to think of ways to rouse Nana from her hibernation. Ken and Rama play African Hi-life music, but Nana snores through the drumbeat. Mama cooks a meal of palaver sauce and plantains, and the spicy aromas tickle everyone's noses, but Nana is too sick to eat. A doctor confirms Nana has croup and says the best remedy is exposure to lots of cold air. Nana surprises everyone by jumping up, opening the window and breathing in the cold winter breeze. She vows to "sit here by the window and get better quickly." In a playful twist, Nana says, "Living things should dress warmly for the winter", and she reveals that, underneath her robe, she's been wearing a snowsuit, scarf, mittens and boots. The gentle humour in the story is extended through Bushra Junaid's eye-catching collage illustrations. 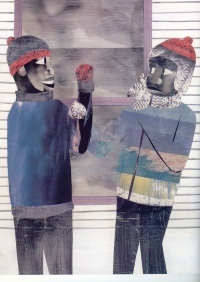 The characters' clothing is cut-out photographic images of the sky, ocean and, in Nana's case, silvery, leafless trees. 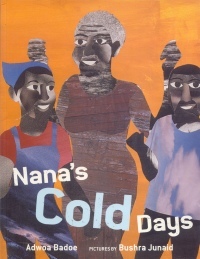 Adwoa Badoe's talent for storytelling shines through this book. Lots of dialogue and repetition make it a good read-aloud selection.